Overview - German Expressionist, F.W. Murnau's film won Academy Awards for Best Actress and Best Cinematography and remains a critically acclaimed piece of silent cinema. George O'Brien plays the young farmer who falls for The Woman From the City (Margaret Livingstone) and agrees to murder his Wife (Janet Gaynor) by drowning her. He is unable to fulfil his plan though, and is reconciled with his Wife. Together they embark on a celebratory adventure in the city (one of the most celebrated montage sequences ever filmed), but on their way home The Wife is lost overboard in a storm and believed drowned. The Woman from the City arrives to claim The Man, believing he has committed murder for her; but word arrives that his Wife has been saved and he rushes to her side. In the world of storytelling, there is perhaps no visual metaphor more simple and timeless than a rising sun. An indelible symbol for new beginnings, second chances, and reignited optimism, the picture of an approaching dawn is a universal sign of hope -- and in F.W. 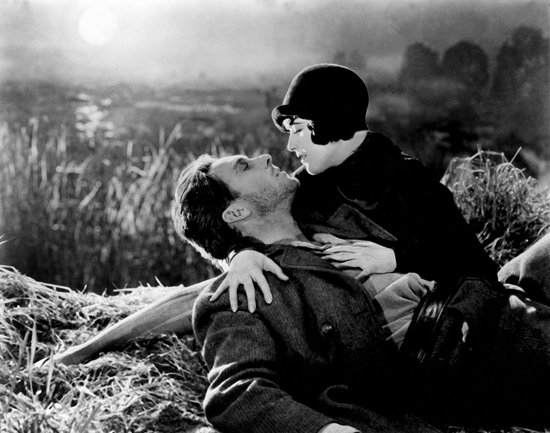 Murnau's 1927 silent masterpiece, 'Sunrise,' that image has never been more joyous and utterly moving. A stirring, groundbreaking, and highly influential piece of moviemaking art, the film is an absolutely enchanting blend of lust fueled resentment and renewed romance, becoming an unapologetic celebration of true love through gorgeous imagery and effortless movements. The rather straightforward tale focuses on a married man (George O'Brien) who is seduced by a temptress from the city (Margaret Livingston). Wishing to have the man all to herself, the alluring woman convinces him to kill his innocent wife (Janet Gaynor). But when the time comes to go through with the unspeakable deed, the nearly hypnotized man suddenly comes to his senses and relents at the last moment. Still fearful for her life, his wife flees to the city, and throughout the day he attempts to repent for his sins and win back her love. Deliberately nameless, the film's protagonists are simply referred to as "The Man" and "The Wife," immediately establishing a universal air that attempts to draw a broader picture of love and the human condition, allowing us all to stand in for the characters. And while the scripting might seem simple on the surface, the uncomplicated story soon gives way to deeper emotions and truly affecting drama. Most of the runtime is simply dedicated to following the man and woman while they travel throughout the city, slowly rekindling their love as they dance and dine. These later courtship scenes are unashamedly romantic and joyous, but the film's earlier stretches actually offer a far darker experience -- tackling some relatively disturbing subject matter that sees the man nearly drown his wife. Actor George O'Brien is almost possessed in these scenes, becoming a kind of lumbering zombie fully caught under the spell of illicit lust. His head is frequently tilted down, masking his eyes from view, desperately trying to avert the gaze of not only the sweet woman he once loved, but the camera as well -- ostensibly full of too much shame to look at either. But when he eventually snaps out of his murderous daze, it's as if a light bulb is switched and the kindness in his eyes reemerges. One key sequence set in a church is particularly moving, and O'Brien's performance is simply heartbreaking. As he watches two strangers get married and hears their vows, the man is overcome with regret and remorse, and his tearful expression speaks volumes. While it might seem downright ridiculous that his wife could ever forgive him for attempted murder, O'Brien manages to fully sell this dramatic turn in that one, incredible moment. In an instant, he becomes but a shell of a man, and through the woman's mercy and affection they are effectively reborn. From then on, the chemistry between the two is infectious, and together they light up the screen as they enjoy the youthful, rekindled spark between them. Actress Janet Gaynor is simply mesmerizing as the sweet-natured wife, and her increasingly playful behavior is a treat to watch. Capturing all of this loving flirtation, is director F.W. Murnau's enchanting lens, using sumptuous camera movements and innovative cinematic techniques to create a sense of exquisite visual poetry. Complicated tracking and dolly work enhance the mood through reframing shots, and the frequent use of superimpositions blends different locations, characters, and scenes together in thematically powerful ways. The manner in which images of the seductress eerily overlay around the man as he contemplates the murder of his wife, is especially effective, and the film as a whole is brimming with meaningful cinematic tricks that all serve the story. Forced perspective shots help to create a grand sense of scale and scope, and Murnau injects palpable hints of German expressionism into his set designs and lighting setups, creating a slightly skewed and shadowy world that heightens the drama and romanticism. And while the film is still a dialogue free affair, a Movietone soundtrack is used that offers a few synchronized background effects like traffic and crowds, bolstering the images with bustling activity. The film was originally released with the subtitle 'A Song of Two Humans,' and really, that description could not be more accurate. Through his poetic images, Murnau creates a visual melody of love and humanity, fueled by bittersweet drama and ultimately joyous affirmations. A true testament to the power of the silent film art form, the movie is widely regarded as one of the best the medium has ever produced -- and I have to agree wholeheartedly. Through narrative simplicity, cinematic ingenuity, and heartfelt performances, 'Sunrise' remains a timeless masterpiece -- one that continues to bask audiences in its radiant light. 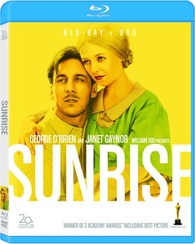 20th Century Fox brings 'Sunrise' to Blu-ray on a single BD-50 disc housed in a keepcase along with a separate DVD copy. Two versions of the film are included on the disc: The original Fox Movietone version (94 min) and the European Silent Version (79 min) which is 15 minutes shorter and features some alternate takes, framing, angles, and editing. After some logos and warnings, the disc transitions to a standard menu. The packaging indicates that the release is Region A coded. Both versions of the movie are provided with a 1080p/AVC MPEG-4 transfer. The Movietone edit is framed in the 1.20:1 aspect ratio and the European Silent version is framed at 1.33:1. Unfortunately, the original Movietone negative was destroyed in a fire and the transfer had to be sourced and restored from a diacetate print. Though very serviceable and authentic, the results still leave a little to be desired. While respectfully restored, the print shows noticeable and consistent signs of moderate age and damage, including vertical lines, specks, and scratches. Some minor contrast pulsing is also evident. A course layer of grain is apparent as well, giving the image a fairly rough look. Clarity can be strong in close-ups, but the picture has a predominantly soft and occasionally fuzzy appearance that sometimes lacks substantial fine detail and depth. Thankfully, the grayscale is nicely rendered with well balanced white and black levels. The European Silent version, however, offers a notable improvement in clarity and depth. Age related damage and wear might be a bit more apparent, but the image is much sharper with nicely pronounced fine details and pleasing dimension. Likewise, contrast is stronger too and blacks appear slightly inkier. Given the circumstances, the Movietone version's shortcomings are certainly understandable, but the resulting image is a little underwhelming. Thankfully, the European cut is actually quite impressive, giving us an interesting alternate edit, and it's great that Fox decided to include both versions for fans to compare. The film is presented with the original Movietone soundtrack in DTS-HD MA mono (with a reconfigured version for the shorter European cut) and an additional Olympia Chamber Orchestra score composed and conducted by Timothy Brock for the Movietone version in Dolby Digital 2.0. English, Spanish and French subtitles are also included for the European inter-titles. While it clearly shows its age, this is a very satisfactory audio track that preserves the movie's unique Movietone soundtrack well. Music and effects are noticeably strained and flat, but the score comes through cleanly and various atmospheric effects like traffic, wind, and crowds add a nice extra layer to the otherwise silent film. Despite the overall boxiness of the mix, major background hissing, pops, and crackle are thankfully absent. The Timothy Brock score offers an alternate music only track for the film with a pristine (but disappointingly lossless) 2.0 recording. It's an interesting option and a nice inclusion, but I still prefer the original. Much like the video, the audio mix can't help but show its age, but the results are still very adequate and considering the loss of the original negative and soundtrack, we're lucky to get to hear the Movietone version at all. 20th Century Fox has provided a solid collection of supplements, including an informative commentary track. All of the special features are presented in standard definition with Dolby Digital 1.0 sound and no subtitle options, unless noted otherwise. Commentary by ASC Cinematographer John Bailey - Bailey offers a steady and informative track, mostly focused on the film's visuals. Production trivia and the movie's place within history are touched upon along with lots of details about specific compositions, camera movements, lighting designs, uses of shadows, German expressionism influences, and in-camera effects, offering a very solid commentary that classic film fans should enjoy. Outtakes with Commentary by Cinematographer John Bailey (SD, 10 min) - This is a reel of alternate shots, angles, and takes from a few scenes along with commentary by John Bailey. Outtakes with Text Cards (SD, 10 min) - The same reel of alternate shots, angles, and takes is included with text cards explaining their context within the film along with production trivia. Original Scenario by Carl Mayer with Annotations by F.W. Murnau - The film's original written scenario is included as an image slideshow. Sunrise Screenplay - The film's script is included as an image slideshow. Restoration Notes - Text information about the film's Movietone process, differences in the silent version, and restoration are included. Theatrical Trailer (SD, 2 min) - The film's trailer is included. 'Sunrise' is a genuine masterpiece of the silent art form that continues to easily stand the test of time. Filled with gorgeous images, innovative cinematic techniques, heartfelt storytelling, and moving performances, this is simply moviemaking at its most pure and beautiful. Though the Movietone print does show its age, the video transfer is still very respectable, and the alternate European version actually features a rather impressive picture. The soundtrack is a bit strained and thin, but remains authentic and perfectly serviceable. Supplements are very solid, including a worthwhile commentary. This is one of my personal favorite films, and thankfully, 20th Century Fox has given the movie the treatment it deserves. Highly recommended.